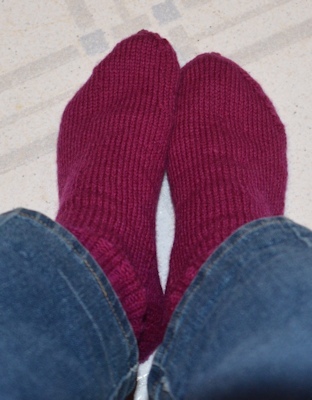 The "Blackberry" Socks--finished Saturday night, March 7. Put on for the first time this evening, for their "first wearing" portrait. And the Orlon/wool blend light-blue and white socks are now (Sunday night, March 8) ready for the heel turn, though I need to wait for daylight to do that. Both pictures taken at night indoors, by kitchen light + camera flash. These socks are not the same size or knitted in the same gauge. They're on size 4 needles, not 5s, and are for a smaller person. Thanks. I do like being able to have socks in any color the yarn mfg makes--which isn't *quite* every color I'd like, but certainly a wide range. My regular socks are normally hidden under the long pants or jeans I wear, but when I'm talking socks or knitting and pull up a pants leg to show them, people are often surprised to find...gasp...bright colors. Well, why not? Thank you. Turned the heels of the blue and white socks this morning--making stupid mistakes TWICE (maybe should have had breakfast first?) and will do the part I like least, picking up stitches along the heel flap, later today. 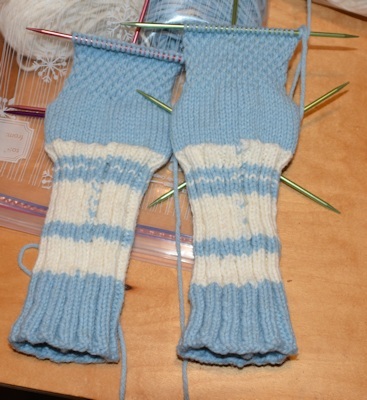 Of all the things I wrote down for K's sock pattern, the one I didn't write down was the gusset decrease formula. All the books say dc on 1 row, skip one row. For my own socks, it's dc on 2 rows, skip one row, because of the shape of my foot. You will notice that they're not the same color in any of the three pictures. On the website where I bought the yarn, it was not given a color name, just the number (IIRC) so my choice of "blackberry" is based on the time I made jelly from wild blackberries while traveling. I made jams and jellies several times along the way from wild fruit (strawberries, huckleberries, and blackberries) and this is the color of the juice as it was cooking in the pot. The berries themselves did look blacker (this was in Smokey Mountains National Park; the bushes were as tall or taller than I am.) I do think the yarn looks the color of (some) mulberries and some pokeberries, but I swear on a stack of memories that the blackberry juice was this color too.